Is life suffering and death liberation? To decode the enigma of the cycle of these two may seem the ‘very purpose of existence’ for many of us however for ‘Karunashraya’, a palliative care organisation run by the Bangalore Hospice Trust, “Life and death are one thread, the same line viewed from different sides”. This 17-year old ‘abode of compassion’ offers free professional holistic care to individuals whose disease is beyond cure. Sree Satkriya Foundation’s “Sat Jagruti” is an awareness campaign which covers perspectives on various aspects of cancer. One of our special features ‘Asha Kiran’ seeks to redefine hope, life and death from a palliative care perspective and who better than Dr. Nagesh Simha, President of Indian Association of Palliative Care to do so? As part of our cancer initiative, we met Dr.Nagesh Simha, who is also the Medical Director of Karunashraya, and got his stance on hospice or ‘end-of-life’ care for cancer, euthanasia and much more. Here are excerpts from our hour-long conversation. Over the years, I’ve realized that if something has to happen, the universe brings people together. It so happened that, on a Sunday morning, in 1986, my Rotarian friend invited me to the Bangalore Club to meet two gentlemen who had set-up the Indian Cancer Society, Karnataka Chapter, over a glass of beer. They were looking at how to go about this society when I gave them my suggestions and gradually got involved in their activities. So technically Karunashraya was conceived over ‘a glass of beer’. Almost after a year or maybe two, Captain Gurmeet Randhawa, the current Managing Trustee of Rotary Club of Indranagar felt we should have an ongoing project involving all Rotarians. That’s when i thought why not collaborate with Indian Cancer Society and mooted the idea to the ICS committee. They were very forthcoming about it and after many rounds of mutual discussion, a separate trust ‘Bangalore Hospice Trust’ was formed in October 1994 and that’s how Karunashraya as an ‘idea’ came about. It may sound ‘oh by the way’ or a coincidence but in my dictionary the word ‘coincidence’ does not exist. I think it’s a grand plan of the universe. What exactly is palliative care? Is palliative care just specific to cancer? In simple terms, ‘it’s the active and total care of an individual whose disease has gone beyond cure. Therefore it is not restricted to cancer. It could be end-stage kidney or cardiac disease, HIV AIDS or it could be someone who has just had an accident and became paraplegic. When we say ‘total care’ it not only refers to the physical aspect but also the emotional, psychological, social and spiritual aspects. And it also involves the family of the patient, the professional caregivers such as the doctors,nurses and social workers.It follows a holistic approach. Palliative care starts at the time of diagnosis itself. Unfortunately 75% of the cancer patients reach the doctor when it’s really advanced. People tend to always associate death with palliative care but ‘we affirm life and death as a normal process’. Initially palliative care may seem medical but once that aspect is addressed, it is the non-medical aspects which we work on. Can you give us an outline of the core responsibilities of a palliative care specialist including how Karunashraya helps advanced stage cancer patients? A palliative care team comprises of a palliative care physician, nurses, psychologists and social workers, not just a specialist. 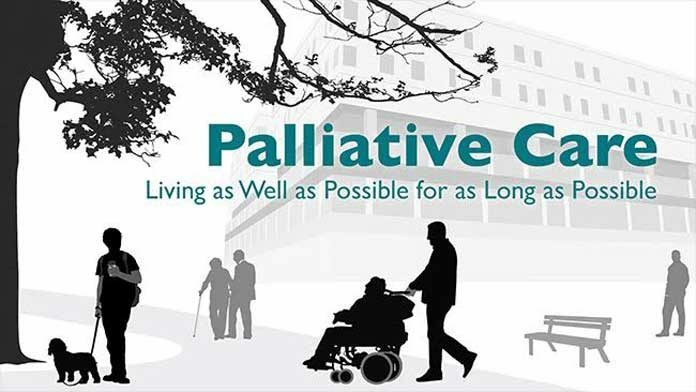 The actual WHO definition of palliative care talks about impeccable assessment and prevention of suffering and a palliative care team ensures that. A palliative care specialist must be non-judgemental and intrinsically compassionate. There is a huge difference between ‘empathy’ and ‘compassion’. One can radiate love, care and concern but one has to insulate himself or herself since in an emotionally charged environment, one may tend to get too involved with the patient hence the need to be so. Empathetic listening, assistance in informed decision-making – all these are a part of palliative care. There is this concept of ‘total pain’. Pain is defined as “an unpleasant sensory and emotional experience, associated with actual or potential tissue damage or described in such terms”. Handling the ‘emotional’ aspect of pain is also a part of palliative care. Another thing about palliative care is that it goes beyond treatment. There have been several instances in the past wherein we have gone beyond treatment. In one such case, a woman’s cremation was arranged at Srirangapatna, according to her last wish and in another, a woman was reunited with her lost family. We take assistance from NGOs in such cases. So that’s how ‘palliative care’ provides a holistic approach to cancer-care and not just pain relieving. Can you give us a general idea on what kind of methods and interventions you use to support patients and their families through the crisis that they encounter in the face of impending death? I’ll give you a very general perspective on this. Upon admission, we undertake a background check of the patient and his family and try to find out if the patient is aware of his condition. You will be surprised to know that at least 25% of our patients are not aware of their exact state of affairs. If the patient is not aware, the first step is to make the patient aware of his or her condition after that we follow a standard procedure in which we understand what support to offer, medically and non-medically. There have been instances where we have to assist a patient to die peacefully since he or she would have been holding onto something and we take care of that so that their soul may rest in peace. We also have an MOU with National Institute of Mental Health and Neuro Sciences (NIMHANS) for training social workers on systematic intervention in such cases. How would you assess a female patient versus a male patient in terms of cancer recovery rate/coping-up rate in terms of their response to the positive affirmations they receive in the course of palliative care provided at Karunashraya? Although during the course of palliative care we don’t differentiate between male and female, interestingly, we have more female admissions into Karunashraya than male. Perhaps it has something to do with the patriarchal set-up we are in, where, a woman is more willing to take care of her husband when he falls ill than vice-versa. Iam not casting aspersions on people. As for coping up, that’s food for thought for us. But i guess a woman and a man tend to approach life in different ways but as far as our approach is concerned, it really doesn’t matter. Tell us about ‘paediatric palliative care’ – isn’t it the most challenging aspect of your work? The concept of ‘death’ sinks into a child after a he or she turns 7 years of age. In a child who is less than 7 years, apart from the physical pain, a child doesn’t really comprehend his exact state. In fact it is the parents who need counselling. Nevertheless handling a child is emotionally draining. Whenever there is death of a child, there are a lot of outbursts from the nurses and then we have to allow them to ventilate, counsel them and so on. Among teenagers, there is always regret in two perspectives – one is that he or she may not live long to pursue his ambition and then the guilt that he or she may not live long to take care of his parents. Can you share an experience in your career that illustrates what you love most about being into palliative care ? I decided to be a surgeon when I was 3 and when the time came that I had to leave surgery due to my failing kidneys, I was so relieved, since I had lost interest in standing for 6 hours and removing different body parts. Palliative care is far more fulfilling, as an individual. Now at this stage of my life, I play more of a facilitator’s role for the younger generation. We’ve been collaborating with different universities in the creation of courses. With a new organisation named ‘e-cancer’, we have created modules for palliative care nurses and doctors to refer online, free of cost. We are also doing a lot for ‘end of life’ care through creation of a task-force named ELICIT and ‘care for the dying’ advocacy. The fact that we are able to take care of someone’s needs when they are in the evening of their lives and let someone ‘die in peace’ is soulfully-gratifying. Would you advocate ‘Euthanasia’ (mercy killing) for ‘no-hope’ cases? The word ‘Euthanasia’ applies only to animals now. It’s an outdated definition and more so when we talk about active and passive euthanasia. There is nothing “passive” about killing somebody. The ‘lexicon’ has to change. In extreme cases, there are countries in the world that allow what they call ‘physician-assisted suicide’ and ironically these countries allow it, despite having the best palliative care services. But let me confess there are days when we see people suffering so much that we wish, out of frustration that we could liberate them and there have been umpteen occasions when patients say – ‘give me something, let me die’ and they wish so due to uncontrollable pain. But we cannot do that due to the ‘slippery slope of morality’. However in cases of excruciating pain, my point is ‘why not have basic morality while treating them?’ Why put someone on a ventilator when he is dying of organ failure or why give an old man a cardiac massage when he is dying of an advanced stage cancer? That is being ‘compassionate’, not ‘euthanasia’. We are redefining public perceptions of ‘end of life care’. Ethics in critical care is extremely vital. Ultimately give death a chance. I need to be very clear in my mind that I am not committing a sin. We at the ELICIT task-force have sent the draft of a bill to the government where we have come up with solutions – that it should be a collective decision between the medical team and the patient’s family. “Therefore the concept of passive euthanasia should be consigned to the dustbin of history”. Any message to all of us? My first message is – The biggest impediment to palliative care is the medical profession.Sometimes, we medical professionals think that if someone is dying, it is a failure on our part. That should change – we need to accept death as a natural process. My second message is to the younger generation of medical professionals – palliative medicine as a career option is excellent. Some universities offer M.D courses, fellowship programmes apart from training programmes. Even if you don’t practice palliative medicine as a specialist, it would be worthwhile to take-up short-term programmes or courses. You will then be better doctors and the concepts of how to care for patients such as unnecessary chemo not required, unnecessary surgery not required – all these will change. Most importantly, palliative medicine is not a morbid subject. It’s very fulfilling as a subject. .
Lastly – value a person when he or she is alive. This World Cancer Day, let’s redefine ‘hope’ – hope not for a long life..but for a better quality of life and a pain-free life, until it is liberated to ‘death with dignity’.